Pro-Russian militants launch 27 shooting attacks against the antiterrorist operation (ATO) forces, he says. 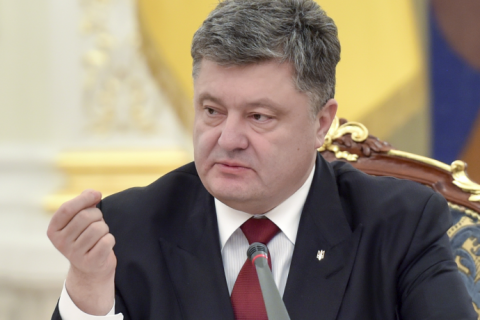 President Petro Poroshenko has said two Ukrainian servicemen were killed in the ATO in Donbas on 21 January. "Yesterday my country lost three servicemen, two more were killed today," he said in an interview with Bloomberg TV. He also mentioned that the separatists carried out 27 shooting attacks against the ATO positions. Earlier, the ATO HQ said that six Ukrainian servicemen were wounded in the ATO area on 20 January. No lethal cases were reported. In its regular evening update the ATO HQ said it had registered 16 shooting attacks by the separatists over the day, most of them in the Donetsk sector. Separatists engaged Ukrainian servicemen with aimed fire near Novoselivka and Novhorodske with small arms, automatic grenade launchers and infantry fighting vehicles. They used heavy machine guns and small arms against Ukrainian strongpoints near Troyitske, Pisky and Opytne. An enemy sniper was spotted near Maryinka.